Every year I have a really difficult time figuring out where all of my favorite TV shows went to. They never make a big splash announcement when a show is canceled. All you hear about at the beginning of the year is what’s new. Also they rarely make a big deal about a show changing days are times unless it changes midseason. All of the networks have sections on their websites explaining the fall season but they never do it in a very organized fashion. ABC provides a list of their new shows but if you want to see the schedule that make you download a PDF file. NBC did a pretty good job of providing a schedule but if you want to see what their midseason replacements are it doesn’t really tell you when and where they are coming. I thought CBS was going to take the prize for worst layout and they new fall schedule because it failed to list any programs whatsoever on Saturday night. Fox always does a really good job of announcing their midseason replacements right away. Their chart is easy to read however it was a little difficult to find the 2008 chart. (Hint: click the word “schedules” on the left side of their page and it will split into 2007 and 2008 links). The CW Network takes this year’s award for worst layout of a fall schedule. However not to fear my fearless blog readers! I’ve done all of the dirty work for you. Click this link for my handy dandy page that summarizes everything. 452 Time to erase all of those junk movies from your TiVo and get ready for the new season. Enjoy! In my next installment I create video testimony about my support for legalized internet gambling. This is the 16th and last in a series of articles about my recent quest to replace a broken VCR in this era of DVDs, DVRs, and other newfangled gadgets. Click here for the beginning of the series. 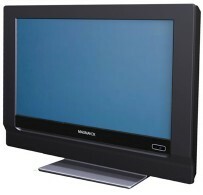 During the course of writing this series of articles about TVs, VCRs etc. 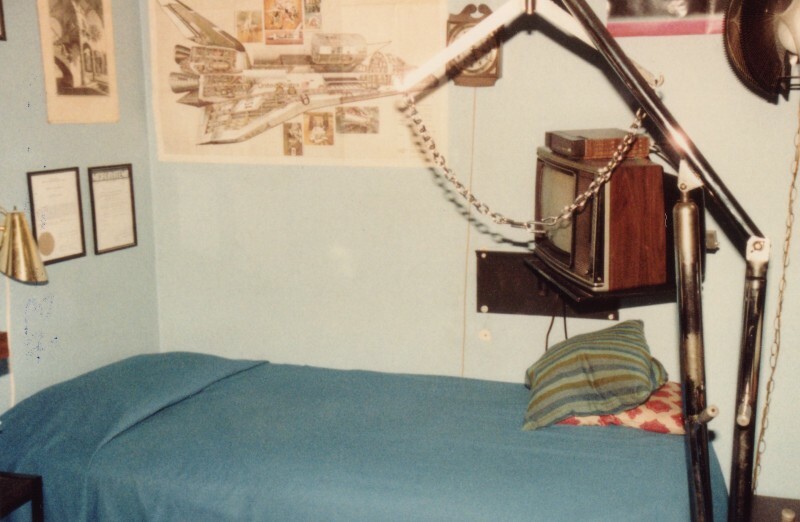 my Dad stumbled across some photographs he took in 1984 of our living room and my bedroom. He kept the photos in a box in the garage for insurance purposes to document our consumer electronics in case they were damaged or stolen. The images of my old kit built computer and of me sitting at my old Radio Shack Model I computer in an earlier installment or from some of those photos. Here are a collection of some other photos with close-ups. You can click on most of the images for larger versions. The first image shows our old 25 inch color Zenith cable ready TV in our living room. Note that NASCAR is on the screen. On the lower right is a cabinet that contained all of our videotapes. None of them were prerecorded tapes. Most of it was movies and specials we taped off of HBO and other cable channels. This next image shows the old RCA VFP-170 SelectaVision convertible VCR that is described in an earlier post along with my old video camera. The images I used in a previous post in this blog were all taken from advertisements on eBay or other images I found on the internet. This is the only image I could find of our actual unit. The image below is a close-up of some boxes sitting on top of the end table cabinet next to the TV. The white box on top that is barely visible is one of those slider style cable boxes I talked about in an earlier installment. 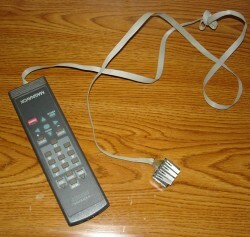 It was used for the VCR which was not cable ready. Note that the TV was cable ready and did not require a converter. The brown box below that is an RF distribution box that allowed us to view cable or VCR in the living room, and two bedrooms. I still have a similar box in the living room today that connects the living room devices to my office and my parents’ bedroom. The next image is a view of my bed with the TV on the wall above it. Note the MC Escher print and the space shuttle poster hanging above the bed. They were there for many years. On the right is my Hoyer that I use to get in and out of bed. Behind that is an old color TV and on top of it is a remote-controlled cable box that I used because the TV wasn’t cable ready. Finally here is a close-up of the TV with cable box on top of it. 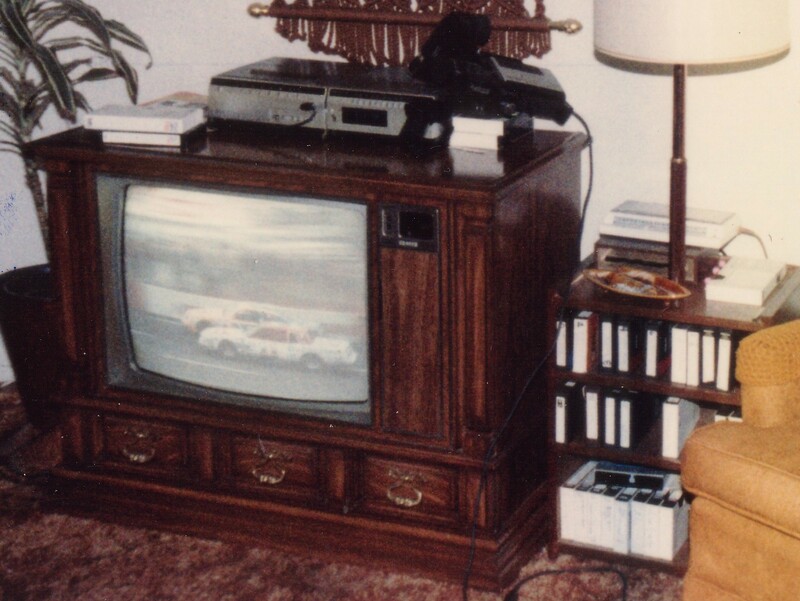 Well that wraps it up for my nostalgic look back at old TVs, VCRs, and cable boxes. I’m not really sure what my next blog series will be but the next entry in my blog will be my preview of the new fall TV series. This is the 15th in a series of articles about my recent quest to replace a broken VCR in this era of DVDs, DVRs, and other newfangled gadgets. Click here for the beginning of the series. Earlier I described how my rewired remotes had 12 buttons as follows. The first column had channel up, channel down, volume up, volume down, and power. The next column had VCR controls of stop, play, fast-forward, and rewind. The three final buttons controlled TV input to either HDTV or VCR, VCR display so I can see the tape counter, and TV zoom to select either 16:9 or 4:3 aspect ratios. That sounds like that’s just about everything you would need until you start thinking about what it takes to work a cable box with a built-in DVR. The desire to have a DVR and have flexibility to use other devices was what really led me to need more switches. In fact as soon as we got the new rewired remote working, Dad drove over to the Bright House Cable office to exchange my Pace 550C HD cable box for a Scientific Atlanta 8300 HD DVR cable box. With this new very powerful cable box/DVR I had plenty of functions I could control with my new 13 switch remote. As it turns out I barely had enough. Let’s talk a little bit about how a universal learning remote works. At the top of most universal remotes you have several device select buttons such as TV, VCR, DVD, cable etc. The Sony remote I’m using can control 8 different devices. 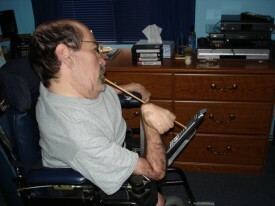 Typically you leave the cable device selected and use it to change channels and work various cable menus. Most universal remotes do not require you to switch to TV mode just to change the volume. However if you have other TV functions such as on-screen display, tuning TV channels or working menus then you have to press the TV button to control the TV and when you are done with that press the cable button to get back to cable control. Similarly you would press the VCR or DVD buttons to work those devices. However with a good learning remote you can put any kinds of codes under any device you want. That ability to put any kind of functions under any device you want is one of the reasons that the Sony remote worked and unfortunately the Zenith remote did not. For some reason the Zenith placed restrictions on this mix and match idea. As an example of how I use this mix and match feature, my cable box has a built in picture-in-picture function but my TV does not. I’m a little short on spare buttons in the cable section so I put the picture-in-picture functions under the TV heading. It’s really nice to have the flexibility to mix different functions within a particular device. Of course it makes it confusing to remember where you put everything but I’ve got a pretty good system worked out in the back of my head somewhere. On my new 13 switch remote I wired it to use four different “devices” on my remote. Although the buttons I planed to use are labeled TV, DVD, SAT, CABLE, the functions that go in those particular “device” slots actually control a wide variety of gadgets. So rather than thinking of them as different devices, I’m going to just call them “groups”. This image shows the micro switches on my remote. The four switches on the right are used to select the group. The other nine switches have the functions themselves. The function of each of these buttons changes depending on which group button you press first. One of the problems I had over the first few days of using the new system was I could not tell if I had actually pushed one of the four group select buttons shown on the right in the image. When you’re using the actual remote in your hand, the device select buttons light up when you press them. The lights tell you if you’ve really pushed the button or not. I can’t see the remote when I’m in bed and sometimes I thought I had pushed the device selects button and I had not. Then when I tried to push a function button, I got the wrong function! When I wired the remote, I didn’t wire the device select micro switches directly into the device select buttons. Instead I wired them into the four system command macro buttons. These buttons allow you to program in a whole series of commands up to 16 steps. For example, on my Dad’s remote the “D” button has been programmed with five steps: CABLE, POWER, TV, POWER, CABLE. This sequence turns on the cable box, turns on the TV, and then selects the cable device for future use. Pressing it again turns everything off. So I needed to program these macro buttons to do more than just select one of the four groups. I needed it to do a function that would be visible on the TV screen but wouldn’t interfere with whatever else I was doing at the time. One interesting thing about this new TV and many TVs these days is that when you press a button, it doesn’t actually do the function immediately. It simply displays on-screen the current situation. In order to get it to actually do the function you have to pump the button twice. So for example if you hit volume up, it doesn’t move the volume up one notch. It displays the current volume setting and if you repeatedly that the volume up while the displays on-screen then it will increase the volume one step at a time. The same thing is true with volume down. So I did the following… pressing the Group #1 button not only selects Group #1 but it does volume up. If I hit the button only once it puts the volume display on the screen but does not change it. Pressing the Group #2 button does the input select functions on the TV in addition to selecting Group #2. Originally I needed this function to toggle between the component input for the VCR and the HDMI input for the cable box. However now I just use it to toggle between the cable ready tuner in the TV and the HDMI. This is because the VCR now goes through the cable box out the HDMI port. The Group #3 button chooses group 3 and turns the TV captions on and off. These two functions on the TV similarly require two keypresses. If you only press the key once, it simply displays the current status. The Group #4 button works the volume down function similar to the way Group #1 button works. So I can push any of these four different group buttons and it will flash information on the screen is that verifies I really did press the button. If I punch the button repeatedly then I can get the actual function as well such as volume up, volume down, caption etc. 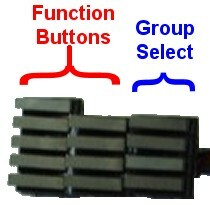 Initially the group select buttons only selected a group. They did not have an additional function associated with them. The volume and other function buttons but I’ve doubled up onto the group select buttons were in other locations. In fact what I’m describing here is about the fourth or fifth different layout I’ve used for these functions as I’ve toyed with it over the past couple of weeks. That’s what’s so great about a programmable learning remote if I can rearrange it anytime I want. Here is a chart explaining all of the functions in each group. C= cable box, T = television, V = VCR. The first group has your basic channel up and down buttons for the cable box. The cable info button tells you information about the current show. This is especially useful when looking at the on-screen cable guide although sometimes it’s nice to use during the currently watched program. The cable play, fast-forward, rewind, and pause buttons are for the DVR function of the cable box. The Back button is an instant eight second rewind feature that is especially useful when you are fast forwarding through a commercial and overshoot the end of it. You can just pump the “Back” button until you get to the place where the program resumes. On my other remotes I never use the favorite channels feature. I watch so many different channels I don’t really have favorites and if I want to skip around I simply punching the channel numbers. But when you have over 200 channels and only a channel up and channel down at to navigate it’s a long way from TBS on Channel 22 to ESPN2 HD on Channel 761. So I programmed in a favorites button to toggle through a list of favorites just to get me from one section of channels to another in addition to picking a few favorites along the way. The second group is used while watching the VCR. The VCR stop, play, fast-forward, rewind buttons are used to watch the tape. The VCR display button toggles the on-screen tape counter which I need when I’m searching through a tape looking for a program. The TV zoom button is used a lot when watching tape because my VCR records HD programs as letterboxed 4:3 aspect ratio so I can use the TV zoom button to make them fill the 16:9 sized screen. The other buttons in this group require some explanation. Originally I had my cable box connected to the TV using either component RCA cables or a digital DVI cable. The VCR was connected to the TV by standard composite RCA cables. I needed a TV input button to toggle between the two. However the new cable box has an auxiliary composite input. It can be used to plug-in a VCR, DVD, camcorder etc. In order to view a device connected to this input you hit the “Cable Bypass” button. The signal then passes through the cable box and onto the television. This cable box has HDMI output that I am using to connect to the TV. The cable box is slick enough to convert the analog composite input from my VCR connected to the auxiliary jack into the digital signal that is sent to the TV to the HDMI port. That meant three less cables connected to my TV. So when I want to watch the VCR I hit the cable bypass button and presto… I’m watching the VCR. r decoding system other than ATSC tuner to view them. Group 3 buttons are navigation buttons used by the cable box. The arrow keys and the select key are pretty much self-explanatory. I decided I didn’t need a left arrow key. Most of the menus will wrap around if you keep pushing the right arrow. The remote has three special function keys labeled A, B, and C that are used for various purposes. The “A” button usually means “Yes” in various “Are You Sure?” prompts. The “C” button is often used for cancel or go back one menu. The cable menu button is used for a variety of things that I use it mostly to turn the closed captions off and on. It can also be used as to select a menu that does “Record the current program”. Because that function was accessible through the cable menu I did not need to program a separate Cable Record button. Note that most of your DVR recording is done by selecting the program on the cable guide and it doesn’t require the use of record button either. The Cable List button calls up the list of recorded programs on the DVR. Group #4 is basically the “everything-else-that-doesn’t-fit-in-a-different-group” category. Initially I wasn’t even sure I would add a 13th button so that I could have four groups however I didn’t really think about all of the extra capabilities this cable box/DVR and available. 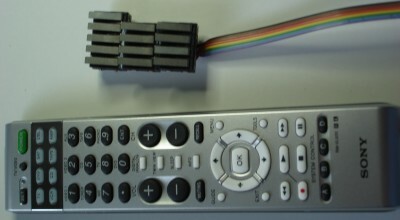 The Pip, Move, and Swap buttons are used for the picture in picture function of the cable box. The cable zoom button is different from the TV zoom. It would take me several paragraphs to explain why sometimes I want to zoom using the TV and sometimes using the cable but trust me they are both useful under certain circumstances. I found that on some occasions I do actually need the cable stop button to cancel the recording of a current program. However I use it so rarely it belongs here. I could live without calling up the cable guide but it’s amazing that I can do just about anything from a bed remote with these micro switches that I can do with a regular remote. On several occasions I’ve called up the cable guide to see what other programs are on and I can actually schedule recordings on my DVR while in bed. When it’s all over with I need to shut everything off. Therefore we have power buttons for the TV, VCR, and cable box. I could just shut off the TV and let the VCR and cable box run all night but hey… why contribute to global warming? If I ever have other special functions I need, I can always substitute different functions in some of those power buttons. And let’s face it I don’t really need picture-in-picture but it sure is nice once in a while. Well that wraps up my story. I now have a DVR/cable box connected to my HDTV in my bedroom. I have two VCRs also connected which I probably will use very little. If I get a new cable box or different VCR or perhaps someday a DVD recorder I can always re-program the buttons on my learning remote to do something different. At one point I had to have five very thick RCA cables connecting my TV. Now I’ve got it down to a single HDMI cable and a piece of coaxial. I can record two programs simultaneously in HD on the DVR and watch a third local channel in HD at the same time or I can watch a previously recorded DVR program or a videotape or DVD all using 13 little RadioShack micro switches. I know you’re probably overwhelmed with all of the technobabble but the primary purpose of a blog is to give an outlet for people who like to talk about how clever they are. I think I succeeded in that self-indulgent task and perhaps I’ve entertained you along the way. Although the series essentially finished I’ve got a brief photo epilog for the final installment. This is the 14th in a series of articles about my recent quest to replace a broken VCR in this era of DVDs, DVRs, and other newfangled gadgets. Click here for the beginning of the series. Before I try to explain why on earth I would want to start from scratch yet again and asked Dad to rewire a second Sony remote that was especially difficult to work on, I need to go back and tell you some other history that was going on at the time. This entire adventure to replace my broken VCR began in early April 2007. All of the discoveries about tunerless VCRs and my failed first attempt to rewire a remote to use a new VCR all occurred at around that time. Then in early June my 17 inch Dell W1700 HDTV that I use my bedroom suddenly quit working (see image on the right). I had purchased it on eBay for about $275 as a factory rebuild. It originally retailed for about $700. I’ll tell you about the replacement that I bought in a moment but first I’ll say I gave the broken unit to a guy that Dad works with who likes to tinker with broken equipment. He discovered why factory rebuilt units were available. The luminescent back panel had a poorly designed circuit that burned out easily. Whenever you sent them into the factory they simply replace it with another identical copy of the poorly designed circuit. He had already tinkered around with it quite a bit before he found out about the replacement part and he was scared to invest $80 in it in case he had broken something else along the way. 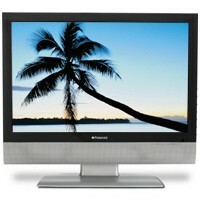 At the time I bought the TV on eBay you couldn’t get a widescreen HD capable monitor anywhere near that inexpensive but as I looked around for a replacement I saw a number of 19 inch widescreen HD monitors available various places for just under $300. We went to Wal-Mart and got a Polaroid TLA-01991C 19 inch HDTV for about $285 (see image on the left). When I got it home I was seriously disappointed. 95% of the time I watched the TV in bed so I’m laying down looking up at it. From that angle the LCD display washes out almost completely. I had to tilt the mount at a downward angle in order to get a halfway decent picture. And that’s exactly what I got… a halfway decent picture. It was not nearly as good as the 17 inch Dell that I’d had before. There was one other problem however that was a deal breaker. In order to watch HD programs you need to use 5 component video cables or an HDMI digital cable. To watch the VCR you need three composite video cables. You have to switch the TV input back and forth depending on whether or not you’re watching VCR or HDTV. On the Dell TV a single button toggled through the various input settings. On the Polaroid you hit the “input” button and it called up a menu. You then had to hit up or down arrow to get to the proper input and then hit a “select” button to select it. It would have taken three additional buttons on the remote control just for this one function. I ended up taking it back and getting a Magnavox 19 inch 19MF387B_27 HDTV at Best Buy (see image on the right). It cost just over $400 which was more than I wanted to spend but I didn’t have any choice. Before I bought it I went to the Magnavox website and downloaded the user manual to make sure that you could change the input function using a single key. When I got it home I discovered it still had the same viewing angle problems that the Polaroid had. It probably had the same LCD in it as the other model with different software and a different brand name on the outside. At any rate I just have to put up with having the television angled downward. The picture quality still wasn’t as good as I hoped at first. It took a lot of adjustment of the various color, brightness, contrast controls to get something that I could live with. It’s been performing pretty well ever since then but it sure took a lot of adjustment. I mentioned earlier that a second VCR went bad on me and I had a hard time finding a Sony replacement for it through an internet closeout reseller. This entire adventure was a real wake-up call for me that the days of using nine or even 11 micro switches to control my TV and equipment from bed were eventually going to be numbered. VCRs were probably going to become a thing of the past and would be completely replaced by DVRs and DVD recorders. All of these were going to require more and more buttons to use. Suddenly I had a brainstorm! If I dedicated some of my buttons to the device select functions on the remote then all of my other buttons could have multiple functions. For example out of the 11 switches, if I made three of them device select buttons then the remaining nine switches could control a total of 27 different functions! Although you can reprogram almost any button on a learning remote to do any function, the one thing you cannot program it to do is be a device select button. That is with one exception… the Sony remote I’ve been using has four buttons at the bottom labeled A, B, C, & D. They are described as “System Control” buttons. They are actually macro buttons that can be used to store an entire sequence of key presses including device select buttons. If I wired into those System Control buttons I can use it to switch which device I was using and I could also put a function of some kind in there. That would give me 27 functions out of the nine non-macro functions plus four more functions piggybacked onto the macro buttons that I use for device select. With this many buttons there would be all sorts of opportunities to use more sophisticated equipment. I can get a DVD burner if VCRs eventually are totally discontinued or I could have a second DVR in my bedroom. In fact the hassle of swapping tapes and keeping track of what programs were on what tape was getting to be a really big hassle. For just six dollars extra per month I could have my own DVR in the bedroom. I talked it over with Dad and he said he wouldn’t mind starting from scratch and rewiring another Sony learning remote. We were in no hurry to do it. I already had a remote that was working really well so we didn’t have anything to lose except a little money, time, and effort. Well we went for it and we did it! Since the Sony remote has 4 macro buttons, I decided to go ahead and add one more micro switch to the cluster. This gave me 13 buttons. Four of them would be device select buttons and would have a function besides that. Nine of them would be function buttons that depending on which device I had previously selected it would now have 36 different functions available. Surely that would be enough to last me for a very, very long time. In the next and final installment I will describe what I did with all those functions. This is the 13th in a series of articles about my recent quest to replace a broken VCR in this era of DVDs, DVRs, and other newfangled gadgets. Click here for the beginning of the series. When I’m not in bed I don’t need to have a rewired remote. I just need remote where I can reach it so I can poke at it with my stick that I use to type on the computer. On the right is an image of me working my remote in my bedroom. In the background you can see a cable box and a couple of VCRs. The remote is connected to a small aluminum bracket that fits in a slot in the front of the control box on my wheelchair. It is attached to the bracket with Velcro so I can change remotes or use it for other purposes such as my scanner radio that I take to the race track. I’m used a variety of learning remotes over the years. I had Zenith that worked pretty well for several years but one day I tried to program in one extra button and it locked up on me and wouldn’t do anything after that. I replaced it with a Phillips but it acted rather flaky. Dad had one identical to it and it quit working after six months. Now both dad and I have a really nice Sony RM-LV600 Learning Remote (shown right) that is probably one of the best learning remotes I ever had. I’ve never failed to be able to teach it a code from another remote and the built-in codes are pretty good to begin with. It can control eight different devices. The “Cable” section controls my Scientific Atlantic HD cable box/DVR in the living room as well as my Pace HD cable box in my bedroom. The “TV” section works the Sony HDTV in the living room. The “VCR” section controls my three different JVC VCRs. The “DVD” section controlled my Toshiba VCR which was broken. The “Satellite” section controls my Dell 17 inch HD monitor in the bedroom as well as a 9″ Motorola TV in the kitchen. The “Tape” section controls a 14″ Toshiba TV in my office. The “CD” section controls the DVD player in the living room. It’s really nice that I can control three different VCRs with one section because they are all JVC brand and use the same codes. Since this was the best remote I ever had, I decided it would be the one I used for my next attempt at rewiring a remote for use in bed. I had never taken one of these apart before but something about the exterior just told me it was going to be more difficult to adapt because the buttons were smaller than the earlier remote site had rewired. Dad picked up a new Sony remote and we took it apart. Much to our mutual disappointment it was going to be much more difficult to solder wires into this remote. The three images below illustrate why. The top image is of the inside of the Zenith remote that didn’t work and the bottom two images are of the new Sony remote. The Zenith has silver traces covered with a thin green protective layer of paint or plastic film. Over the top of that are some black carbon traces that are the ones that actually make contact with the buttons. 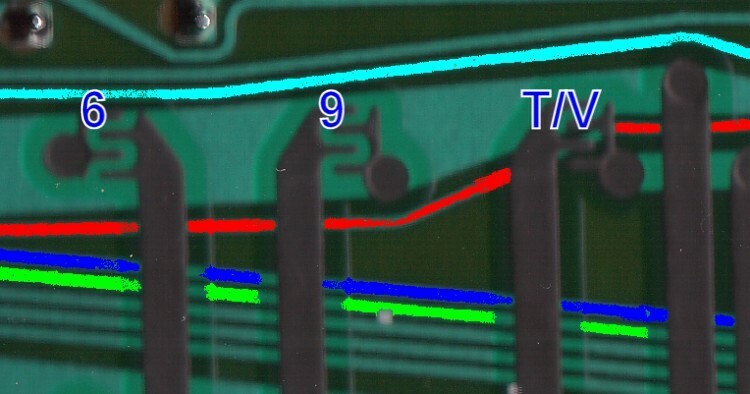 Both of these traces are on the same side of the printed circuit board with nothing but the green plastic layer between them. There are wide areas of light green (actually silver with green coating) that are easy to solder to once you scrape the green paint off. 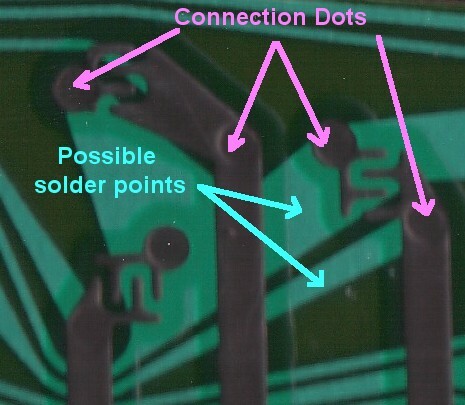 Typically we drill a hole through the printed circuit board and bring the wire up from the opposite side and then solder it onto the shiny stuff. The Sony uses a completely different system. The component side of the board has the little silver traces but instead of black carbon traces laid over that there are some brown traces on the reverse side that make contact with the buttons. The silver traces are extremely narrow and would be impossible to solder a wire onto. The only place that we possibly would be able solder onto are these little white doughnuts which connect the component side silver traces to the buttons side brown traces through a hole in the printed circuit board. To further complicate matters there is a thick layer of white paint protecting the area where the batteries rest as well as a couple of other pressure points where the case touches the circuit board for support. The task of following traces beneath this white paint was going to be a real challenge. When Dad saw the little white donut areas were the only place to solder, he made no promises as to whether or not we would be able to make this work. I’m going to take time out from the story to say that Dad and I did rewire this Sony remote using 12 micro switches and much to our mutual surprise it worked perfectly the first time! I continued to use the Sony remote for a couple of months until one day I had a brainstorm. I decided to start from scratch yet again. I purchased another Sony remote and 13 more micro switches and we built another system from scratch. 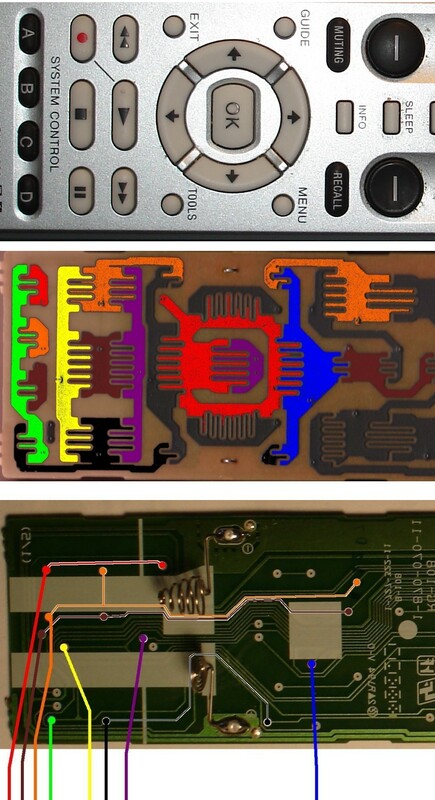 I only mention that now, because I want to explain that the diagrams below are all from this second version of the Sony remote. Its not the version I started telling you about at the beginning of this article. Here are some images of the wiring diagrams I used to trace all of the buttons that I would need and to find solder points were dad could wire in my micro switches. The middle section of the image below has been colorized to show which buttons are connected in common rows and columns of traces. Just above that you can see the actual buttons. For example the “Fast Forward” button connects the black and purple traces where the little interlacing fingers are located. Similarly “Pause” bridges the black and yellow areas. Note that three separate areas are colored orange, three areas are colored brown, and two areas each are colored red, black, and purple. These seemingly disconnected areas are actually connected by traces on the component side of the board. The bottom section of the image shows the component side of the board where we will actually do the soldering. Note that this image has been flipped top to bottom so that it corresponds with the other two images. The colored lines going off the bottom of the board are the wires that Dad will solder in. However there are also other colored traces that I have drawn on the board outlined in white that show how these traces actually connect seemingly disconnected sections on the reverse side. ually peeled off of the printed circuit board and were ruined. That meant that the connection to the trace side had also been ruined and the original buttons on the remote would no longer work. However as long as there was a continuous line from the alternate solder point that ended up going back to the controller chip, the micro switch would still work even if the buttons on the remote itself would not work. Here is a chart showing which buttons correspond to which combinations colorized traces. That takes care of what goes on inside the remote. We also need a wiring diagram for the micro switches. The image below is a computerized rendering I created to show Dad how to wire up the switches. 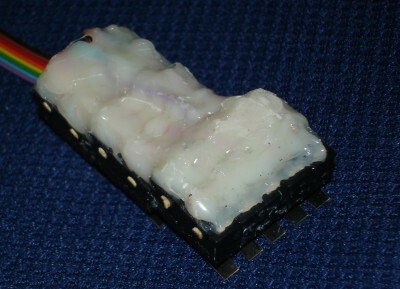 Below are several images of the micro switches after they have been wired. 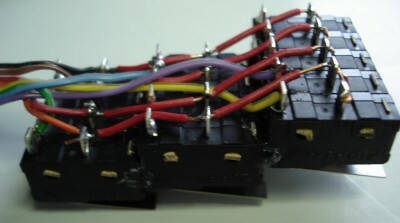 Because there are sharp edges where the wires connect to the pins, we coat the entire underneath side of the switches with globs of hot glue. Not only does it protect my hand but it also provides some strain relief on the wires so that they don’t wiggle loose. Each row of switches is slightly staggered to give me room to actually press the buttons. In our next installment I will explain why on earth would completely start from scratch yet again considering I had a perfectly good working wired remote. This is the 12th in a series of articles about my recent quest to replace a broken VCR in this era of DVDs, DVRs, and other newfangled gadgets. Click here for the beginning of the series. 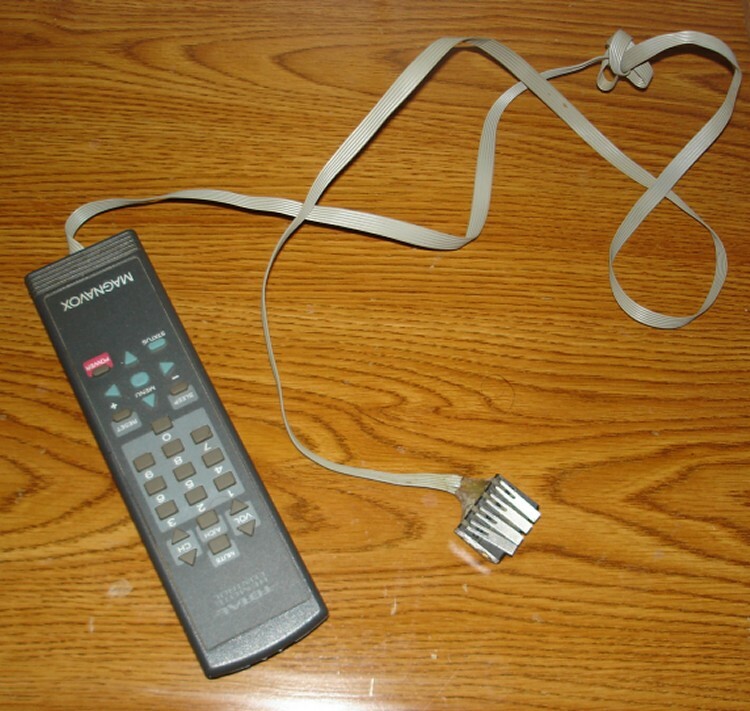 Here is a photograph of the first TV remote control that we wired with the switches. It was a remote for a 13 inch Magnavox stereo color TV. It had only four switches. One was for power. Another was for channel up and the last two were for volume up and down. 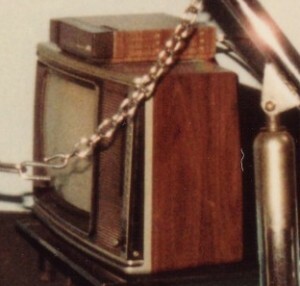 Although this TV was cable ready, at the time there were only about 30 channels on our cable system so it didn’t really take very long to go around the dial to get to the channel you wanted. I limited it to four switches to keep it simple and because I was concerned that I would have difficulty handling more than four switches at a time. In those days they didn’t have universal remotes. You had a dedicated remote for every device and that was it. If you had to replace a remote you had to write to the manufacturer so it was risky to take it apart and wire buttons into it. Fortunately our rewiring job didn’t damage the remote. In fact I’m still using that television today a good 15 or 20 years later. The TV is mounted on the wall in our bedroom at the Lake. By the time I was ready to replace that television, it was possible to purchase universal remotes inexpensively. So rather than risk damaging the remote that came with the television, I purchased an inexpensive RCA universal remote and we wired it for use with my next television in the bedroom. That same rewired remote served me just fine until just a few months ago. It originally had a record five micro switches! I finally decided that in addition to power, volume up, volume down buttons, I would splurge and have both a channel up and a channel down button. Those are the five switches shown at the bottom of the cluster in the image below. I think it was only three or four years ago that I decided to expand that remote. I added four more buttons for a VCR. These four additional buttons in the middle row control stop, play, fast-forward, and remind. Then a little over a year ago when I got my first HDTV for my bedroom I need two additional buttons. Those are the buttons shown at the top. One of them controls the zoom feature so that I can switch between the 4:3 at 16:9 aspect ratios. The other one toggles between component inputs and composite inputs. Component inputs are connected directly to the cable box for HD viewing. The composite inputs are for the VCR. If you watch through the VCR you don’t get high definition so I needed an extra button to toggle back and forth. Since the zoom and input toggle features were not available on my old RCA universal remote I had to purchase a second “learning” remote to get these two additional features. A learning remote allows you to copy any function from another remote by pointing the two remotes together at capturing the signal. As you can see from this image, three sets of wires connecting the buttons to two different remotes is quite a mess. That mess, combined with the fact that I knew someday I might have a device that the old RCA remote would not control, had led me to decide to rewire the entire thing from scratch. It was such a big job to rewire it I hadn’t done it but now that “someday” was today and the old RCA remote wouldn’t work the new Sony VCR/DVD we were going to have to go ahead and do it now. It turns out that the Sony device used DVD codes and the old remote predated DVDs! I had already purchased a new Zenith ZEN-760 learning remote to replace the old mess. I ordered a new batch of micro switches from RadioShack.com. Because I was going to need 11 of them I didn’t think I could find that many in stock in a local store. Here’s what the inside of the Zenith remote looks like inside and out. The image was created by placing the circuit board on my scanner. The light green areas are silver circuit board traces covered in a layer of green protective coating. The wide black lines are another layer of electrical traces. The large black lump middle left hides the chip that controls everything. In this close-up the green S-shaped areas created by the little black interlacing fingers are where the actual keys go. A metallic contact on the back of the rubber keyboard membrane makes contact with the little interlocking fingers. That completes the circuit and the chip figures out what to do from there. You can’t solder onto the black traces… only the green ones. So you have to figure out where the alternate sides of the little black fingers connect to green traces. Then you can solder wires onto the green traces. The round “connection dots” on either side of these interlaced fingers are the locations where the black traces connect to the pale green traces. The image shows a couple of places where it would be good to solder wires for the button location created by the little fingers on the right. As you can see, the two sets of fingers creating S-curve locations on the left side of the above image share a common trace with the one on the right. That is because you don’t have two unique wires running to every button on the keyboard. If you did, it would take 22 wires to connect my 11 micro switches. If you were to draw a schematic you would see that the keys are actually arranged in a series of rows and columns. The chip in the remote sends a signal down each of the column traces one at a time, many times a second. If a key is being pressed, the signal will come back in one of the row wires. This way the chip knows that the button at that particular row and column is being pushed. In earlier remotes, I had to use the actual button locations for volume up, volume down, channel up, channel down etc. Sometimes those particular buttons didn’t have easily reachable places to solder wires. In a learning remote you can put any function in any key location. That was going to make the wiring a lot easier. It would also allow me to exploit the row and column arrangement. I could choose buttons that shared common rows and columns and it meant I could run fewer wires to my micro switches. uld blow it up big and use a paint program to label the solder points so that dad could figure out where to put the wires. Also if you used the “color fill” tool on the paint program you can colorize the little green traces in multiple colors and keep track of where they go a lot easier. In the image on the above left I have labeled the locations of the “6”, “9”, & “TV/VCR” buttons as well as colorizing some of the traces so they are easier to follow. I spent about a day working with this remote and creating a wiring diagram for dad to follow. He wired up 11 micro switches for all of the functions I talked about earlier. Then we tried to get the remote to learn all of the functions that we needed. Although you can put any function you want into a button, somehow this remote “knew” whether or not a particular function belonged to a TV, VCR, etc. It wouldn’t let you mix codes from different devices. It assumed you were going to put all of your TV codes under one device, VCR codes under another device, cable box under another device etc. It didn’t really care if you put TV codes in a VCR slot or VCR codes in a cable slot. But it would only let you put one kind of device codes in each device slot. That meant I would’ve had to wire more micro switches into the CBL, TV, & VCR device select buttons. The bottom line was we had completely rewired this new phenomenal remote and it was totally useless! In our next installment we start from scratch with a Sony remote.